So you’re interested in enrolling your child in piano lessons, but aren’t exactly sure where to begin. If you’re like a lot of the parents we talk to, you probably took some piano lessons as a kid, but didn’t necessarily love it and, consequently, didn’t stick with it. So the question is, how can you ensure that your child’s experience will be different? And why, for that matter, do you even want to try? We've all heard stories about the dreaded piano lessons of childhood -- grouchy teachers wrapping students' knuckles over improper hand technique, despotic parents making threats about practicing, etc. So why embark on this journey? Maybe it has something to do with this: In a 2006 study published in the Journal of Educational Psychology, E. Glenn Schellenberg, a researcher at the University of Toronto at Mississauga, found that children given voice and piano lessons had higher IQs as well as better academic performance. What's more, Schellenberg found that the effect got bigger the longer that the children received the lessons--there was a dose-response association. That’s powerful stuff. Powerful enough to make it worth giving music the old college try. 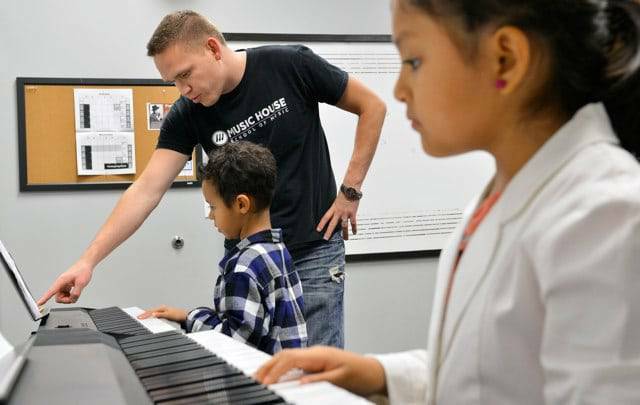 At Music House, we start our students on piano at age 6. The study mentioned above as well as many others like it have consistently indicated that there is a critical period between ages 6 and 8 when musical training can really make a difference. Piano, with its physical accessibility and logical layout, is the ideal instrument for kids that age. This is a crucial window of opportunity. It's a time when music leads to long-term changes to brain development -- positive changes in areas involved with planning and executing movements. It’s pretty clear that extra curricular music lessons offer an almost magical potential for brain boosting, but in order for your child to reap the benefits, he or she has to stick with it. How can you make that happen? Get your child connected to a musical community. Finding a good teacher is a step in the right direction, but getting involved with a music school, with lots of opportunities for group interaction, is even better. Think about it. When children get immersed in something like soccer, it isn’t the isolated activity that hooks them. It’s the social environment — the team and the coach and the games and cheering parents. It’s the whole big cultural experience. If soccer practice was comprised of one coach and one child going over foot technique, week after week, no child would stick with it. Music, the most social of art forms, is no different. Don't be afraid of popular music. Your child does not need to immediately dive into the classical repertoire to reap the benefits of music education. In fact, studying popular music can lead to a couple distinct advantages. First of all, familiar music is much more likely to grab and hold your child's attention. Remember, they can't experience cognitive enhancement without fully engaging with the experience. Secondly, contrary to popular belief, studying pop music exposes students to music theory -- the "why" and "how" of music -- more quickly than just learning to sight-read classical music. This foundation of Theory knowledge will actually help your child become a better sight-reader and better musician in the long run. Get an instrument in the house. Full-sized keys. Do not buy anything with miniature keys. At least 61 keys. 76 is better. 88 keys is ideal. Touch-sensitive keys are essential. "Touch sensitive" keys are not the same as "weighted" keys. Weighted keys are better, but they also carry a much higher price tag. Casio CTK2400. Consider this one as the entry level model. You can purchase one of these, complete with headphones and keyboard stand for less than $130. It's a great option for getting your child started without spending a fortune. Casio WK-225. This is a 76 key touch sensitive keyboard you can find for about $200. Yamaha YPG-235. Another good $200 option. Casio Privia PX-130. Get one of these if you want to splurge on something with weighted keys. It'll set you back about $500 though. Music is a pretty amazing gift to give to someone. Just don't lose sight of why, when and how you're giving it. Follow these pointers and it just might end up being a gift that keeps giving for a lifetime.